As many of the essays in this issue show, David Jones references cultural, literary and art historical resources from throughout western civilization. 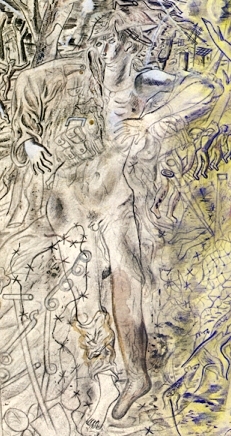 The comparisons below show how Jones uses two iconic art works as a method of portraying his own, personal mythological view of the world. 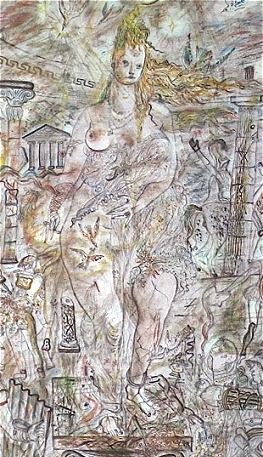 Jones's goddess in Aphrodite in Aulis is, as he has stated, a compendium of many goddesses, but offers suggestions of Botticelli's The Birth of Venus. And his soldiers, one from Aphrodite... and the other from the frontispiece to In Parenthesis, echo Donatello's David. Jones's work is rich with exploring a sense of continuity within artistic traditions. for fuller views of those works.